Running an image, modifying and committing it. This requires to access live container. Using Dockerfile and build it. 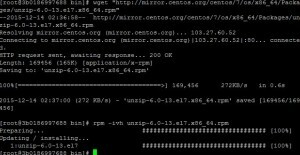 Step1: Pull centos image which will act as base image. -d flag will run container in detach mode (as daemon thread). -v flag mounts the volume. Above command will open bash session for the solr1 container. 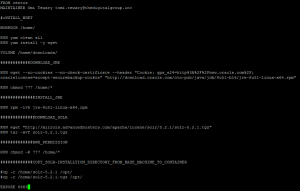 Now we can change directory inside container to /home/project and install solr. Now you can save this image as a tar file. For that you will have to save this image as a tar file. The FROM instruction set the base image for subsequent instruction. The MAINTAINER instruction allows you to set the author. RUN command will execute the command on the bash of container. WORKDIR specify the working directory of container. VOLUME is used for mounting base machine directory to the container. EXPOSE is used for exposing container ports. Apart from this, there are other instructions also available. Refer docker documentation for that. After writing your docker file, execute the following command from the same directory where you have to save your Dockerfile. awesome post. but why would you include images with such poor resolution? Is the related code available anywhere?